Published April 4, 2016 at 2637 × 1744 in Portfolio. 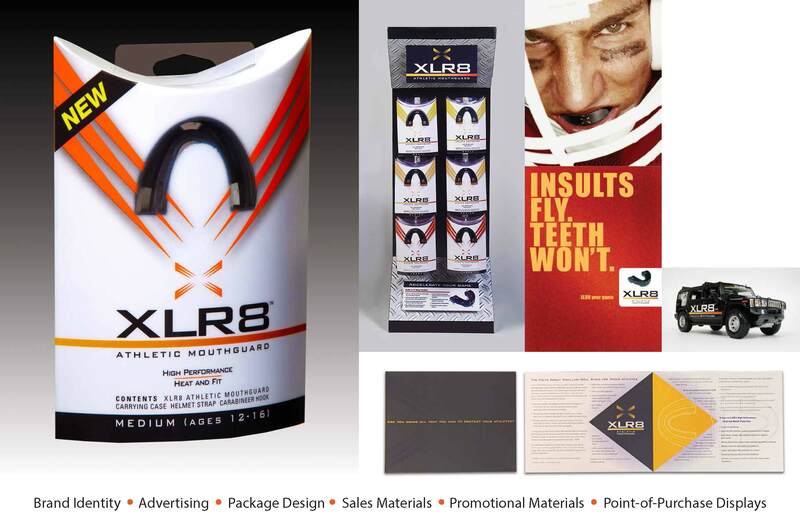 Dental Concepts aimed to introduce the XLR8 Athletic Mouthguard as a superior, youth-oriented products. They wanted the promotions to appeal to kids of all ages and make them feel it was cool to wear the XLR8 Athletic Mouthguard. The unique name, package structure, and graphics gave way to an exciting product launch in the athletic mouthguard category. A “XLR8 Hummer Tour” started in the summer to introduce and give away the product. The tour promotion also demonstrated the weight strength benefi¬ts and promoted the product in each test market to coincide with the advertising. We designed the packaging, advertising, professional sales materials, consumer sales materials, marketing materials, counter displays, free-standing displays, Hummer, and all the premiums for the launch. Dental Concept’s strength was in traditional food, drugs, and mass distribution and sales. The strategy to go into the sports category was implemented too late.